This week I received a new question from http://foodpicker.org . What is the best sugar substitute to use for baking and daily use for diabetics? When making the decision to substitute sugar with artificial sweeteners, it is common to find yourself confused on which types to use. With the many choices you see on the market, it can be easily overwhelming. Which one should I use for baking? Which one is best for my ice tea or coffee? Are they safe? When using sugar substitutes for baking, Sucralose, Acesulfame K, and Saccharin can be used. It is good to remember that sugar substitutes do not provide the same chemical effects that regular sugar undergoes when exposed to high temperatures. For example, browning is usually absent when baking desserts with these product, so presentation may differ from what you may have expected. Saccharin is not recommended for baking, but can be used to sweeten hot and cold foods or beverages. 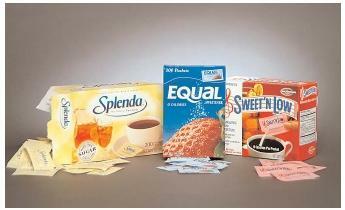 So, if a product is made with these sweeteners instead of sugar, can we have as much as our hearts desire? The answer is unfortunately no. It is true that adding sugar substitutes instead of sugar to your daily meals or beverages can cut down on your carbohydrates, but many products listed as “sugar-free” can actually have MORE carbohydrates and calories than the regular product. Getting in the habit of reading nutritional labels can help you make wise grocery shopping decisions. Remember, even though it may be listed as sugar-free, excess carbohydrates can raise your blood sugar and the hidden calories can cause weight gain. Sugar alcohols, such as mannitol or sorbitol are used in many sugar-free products, but use caution. These sweeteners can raise your blood sugar, and in excess, can cause unpleasant bouts of diarrhea. Aspartame should NOT be used by individuals who have phenylketonuria (PKU), a rare hereditary disease. People with this disease must avoid the amino acid, phenylalanine, which is present in Aspartame. Using any of these artificial sweeteners in place of regular sugar is a great way to reduce daily carbohydrates and calories, but it is good to keep in mind, “everything in moderation.” If you find that you do not prefer the taste of artificial sweeteners, keep regular sugar intake in small portions and count it as part of your daily carbohydrates. These questions are ones I receive from http://foodpicker.org, which is a great resource for diabetes nutrition. If you come across this blog however, and have a question or concern or would like to give feedback please don’t hesitate. It is personally a great learning experience for me and it may be useful information to you. Knowledge is power! thanks! glad it is of some help!